Full View Picture Window Incubator — Includes electronic thermostat, fan and automatic egg turner. Candling Device — Used to check the progress of development. 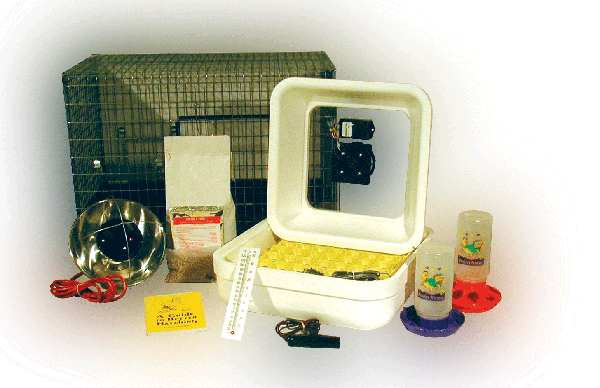 Brooder Cage — measuring 30” W x 18” L x 18” H.
Attention Teachers: Please order this kit 2-3 weeks prior to egg arrival date with your credit card or mail in your school's purchase order. Hatching eggs are sold and shipped separately. Book no longer included with kit. Does the classroom incubator have a warranty? I noticed that the Brinsea Ovation Classroom Incubator does. There is a one year warranty on all our merchandise. Does the automatic turner come ready to use for chicken eggs or do you have to put anything together? Yes, the automatic chicken egg turner included in the Classroom Incubator Kit is already assembled and ready for use. How many eggs does the incubator hold? With the turner, the incubator will hold up to 42 chicken eggs.